This looks quite weak; Warlock doesn't have any board boosts (Savage Roar, Bloodlust, etc) to make the board full 1/1 minions into a real threat. If Warlock gets some way to give demons a powerful attack boost then it might be something, though 1/1s are still very easily cleared. I am sorry this is probably this first time I call trash in this expac. why print this !! Fiendish circle is still there you know! and it doesnt even see play or make sense. Should be 2 mana to justify having it in opening hand and then summon 2 1/1s (overpriced from druid or paladin version but scales)! Warlock doesnt have level up or soul of forest (yet) for token to be viable. It feels really bad, especially as a top-deck in the late-game and especially in zoo. Maybe we, warlocks, will get demon synergies like that MSOG Crystalweaver, so this spell will become decent, but it's really weak in its current state. Honestly I saw the same card in hearthcards and I didn't think it will be a reality. 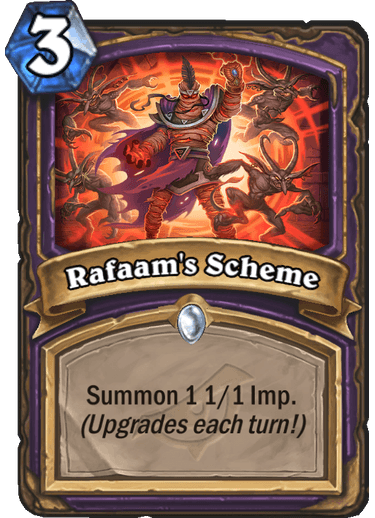 It feels really strange - what does Rafaam have to do with demons? He is an ethereal and I see him more being in the mage class than in the warlock one. But since Dalaran is mages' territory and since they want to protect it, let's just slam this famous character in a random class w/o a good explanation. Hagatha and Toggwaggle get Rare schemes and he gets a common trash. Meh. Can anyone verify if all numbers are improved or just a number of Imps? If the latter, well, snap, that's one terrible card. If the former, I can see someone play this, at least. Forbidden Ritual was a very good card in zoo. And we have things like grim rally now. It's obviously got a cap of 7, but 7 1/1's for 3 mana is a really good deal. The obvious problem is that you're Zoo and you'll be holding this card. I'd say you're happy with 4 1/1's for 3 mana. Is that feasible? We'll have to see. Zoo is not really the "hold this in hand" type of deck. They should at least have rush if not just straight up have their stats upgraded. I don't expect anything amazing from this, but we have a LOT of cards left to see... but it does look pretty bad. Scheme cards are so bad design. They start over-costed and you must work, actually, pray to rngjesus to return them to normal. It's a bit awkward since it's a card that needs to be held, but the effect is most useful for more aggressive decks. But I think if a midrange-ish flood warlock is a thing this will be definitely be one of the best cards in that deck, since after a few turns it becomes very efficient. Not really sure about this card. You can try to combo it with Grim Rally or Knife Juggler but i don't think zoo wants to keep card in hand and wait until it buffs up. So far i dont think this card is any good. Will see if they print some support for it. So it summons X 1/1 imps or 1 X/X imp or X X/X imps ? With blizzard confirmation please, or I'll assume you don't know. I'll assume you don't know because you were too lazy to watch the video. [card]Fiendish Circle [/card] is better than this one by far and even then, that was spell was horrible too.